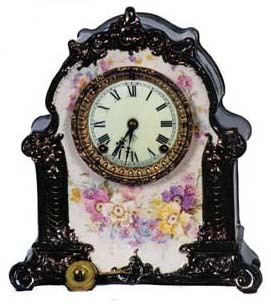 Ansonia Clock Co. "La Mosella", ca 1880\'s, Royal Bonn. 8 day movement strikes on the half hours. Identical to La Mosella at the top, except for the colors and one piece dial. No cracks, chips, or breaks. 100% original and running. Not in current Ansonia catalog but was in the previous one. The base and movement are properly marked.